AMIGOS New York City is no longer accepting applications for Summer 2019, but you can still apply through our National Chapter! Learn more about it and start your application below. If you have questions or would like more information, please contact eaucar@amigosinternational.org. The AMIGOS New York City Chapter is part of a 25 Chapter Network that recruits, trains, and supports AMIGOS volunteers and families in their local community. Volunteers from the Tristate area train together as a group before leaving for their summer experience in Latin America. Our board supports volunteers with packing, pre-departure immunizations, fundraising, and overall preparation. Our chapter recruits, trains, and supports AMIGOS participants and their families from the Tri-State Area. Our chapter accepts participants September through December of the fall prior to each summer experience. During the months of January through June, New York City Chapter participants will take part in local training and fundraising events as they prepare for their AMIGOS experience. The New York City Chapter of Amigos de las Américas is currently looking to fill volunteer board member positions. If you’re looking to join a wonderful organization that is dedicated to provided leadership opportunities to youth in the New York City area please feel free to browse these descriptions and contact president@amigosnyc.org to share your interest or request additional information. 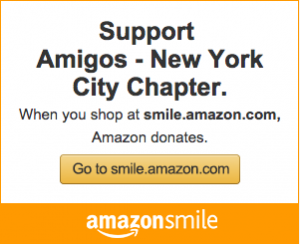 The New York City Chapter of AMIGOS covers program costs through a combination of family payments and fundraising activities. These include a letter-writing annual fund appeal to friends and family, and a spring fundraiser. We chose these activities to maximize our ability to provide the AMIGOS experience to all participants without regard to family financial circumstances. All participants are required to fully take part in each fundraising activity as fundraising skills are an important component of AMIGOS training program and raise awareness of AMIGOS programs in the community. Each participant is required to send out a combination of 100 letters and 100 emails to friends and family, to request individual tax-deductible donations (the revenue from this effort is pooled). Letters are written by the participant with considerable help provided by the chapter during the process. Each family is expected to donate a silent auction item to the Spring Fundraiser and to purchase two (2) tickets.The event format consists of a silent auction featuring approximately 40 items, followed by a live auction of higher valued items masterfully conducted by Jan Nolte, formerly of Christieʼs and parent to an AMIGOS alumna. For more information about the auction contact auction@amigosnyc.org. AMIGOS actively recruits and supports inclusion of participants from diverse backgrounds. AMIGOS provides needs-based financial assistance with distribution determined by family income, number of dependents and special financial circumstances. We provide amounts TBA to qualified applicants as deductions on the family fee. Financial assistance applications are due on November 5th. Please contact info@amigosnyc.org for additional information. In addition, volunteers who are returning for an additional summer receive a $500 discount. Volunteers must attend an info session prior to the November 5th deadline and submit the financial assistance application by this date. With 50 years of experience preparing young people for travel and service abroad, AMIGOS training offers unparalleled global youth leadership development. Pre-departure training equips participants with the critical thinking, communication skills, and technical knowledge they need to make a meaningful impact across cultures while staying healthy and safe. The New York City Chapter AMIGOS training is youth-led, experiential learning that prepares participants for their AMIGOS experience, builds a community of youth and families with shared values, and develops life-skills to help participants succeed beyond AMIGOS. Training sessions are facilitated by Ana Grammatica, the New York City Chapter Training Director.